Most people have the opportunity to save a life. For some, it only takes a decal on their driver’s license. For others, it’s a matter of undergoing various tests, medical procedures and surgery, but it’s a “superpower” a large portion of the population possesses and one that has saved people right here in Nelson County. This is the first in a series of articles highlighting how local residents have been affected by organ donation or how they play a part in raising awareness. A “Donate Life” flag flies at the Nelson County Justice Center Thursday morning. The Circuit Court Clerk’s Office works year round to help community members register as organ donors when they come in to renew their driver’s licenses. A new flag is flying at the Nelson County Justice Center, and it’s carrying a message Circuit Court Clerk Diane Thompson hopes will spread through the community: Registering as an organ donor has the potential to save dozens of lives. Each April, circuit court clerks across the state work with Donate Life America to share the importance of registering as an organ donor, something that can be done when renewing a driver’s license. The effort is something in which the Nelson County team has participated for years. Since 2008, Thompson said her office has added the names of 20,762 Nelson Countians to the state’s donor registry, and that number makes up more than 64 percent of the local adult population. It’s an impressive number and one that continues to grow each time a new name is added, but the need for donors — both living and deceased — is ever-growing. According to the United Network for Organ Sharing, more than 113,000 people in the United States are currently in need of an organ transplant, and about 65 percent are on active waiting lists. Already this year, 6,000 transplants have been performed in the U.S. with the help of nearly 3,000 donors. Among the organs and tissues that can be transplanted from donors are the kidneys, heart, lungs, liver, pancreas, corneas, skin, heart valves, bones, saphenous veins and tendons. A single donor has the potential to help between one and 75 people, depending on what is donated. While many organs are donated from those who have died, some organs, such as kidneys, can also come from living donors. Anyone who desires to be a donor either in life or death is encouraged to register in their state, and their eligibility to donate will be determined later by medical professionals. Children under the age of 18 can also register with parent or guardian consent. Registration status can be changed at any time if the donor changes his mind. 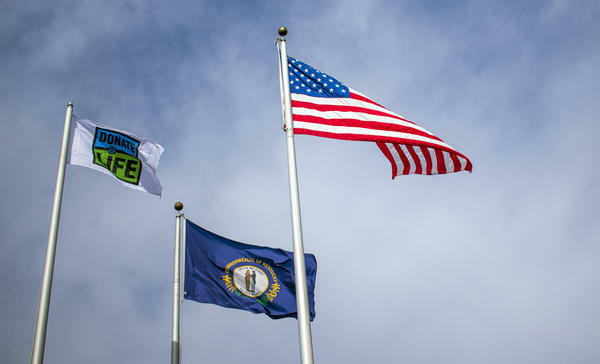 In addition to helping community members register as donors, the clerk’s office also encourages a $1 donation when renewing a license to support the Kentucky Circuit Clerks’ Trust for Life, a non-profit that promotes organ and tissue donation and education throughout the state. While clerks are helping community members register, registration can be done anytime online at donatelifeky.org.